To make small wheels for pull along toys, I use wooden curtain rod dowel 32mm in diameter. Cut a piece about 30mm long. To be sure it is at right angles, I use a scroll saw and roll it into the blade. Mark the center for the axle hole. 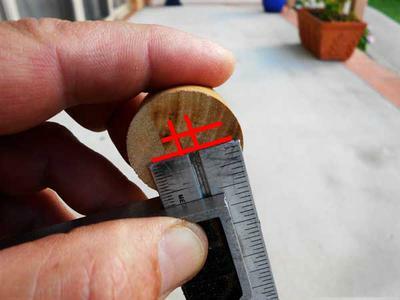 Here I am using my trusty combination square to mark a cross as shown by the red lines in the photo. 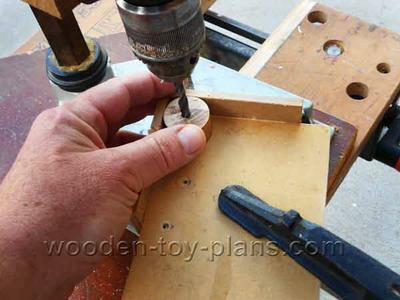 Make a really simple jig as shown in the photo to drill the hole. 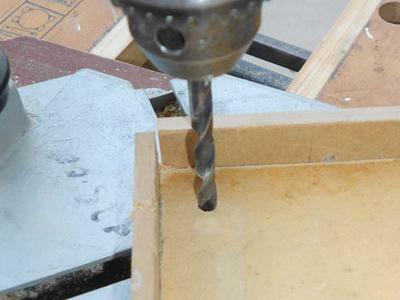 As you drill the hole in the wheel, it will leave a hole in the jig as well. The advantage of this is that you can use this hole to center the jig for more wheels of the same diameter. To round over the sharp edges, run a 6mm bolt through the axle and mount it in the drill. I used a scroll saw and a drill mounted in a drill support.